Sometimes DIY is messy, and this is one of those times. 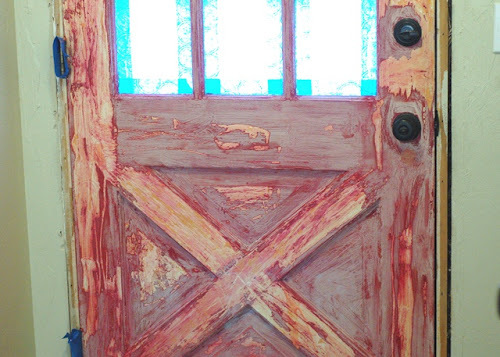 When we first moved to this house, I touched up our red front door and made an impulse decision to carry the color onto the inside surface as well. In my haste I didn't prime first, and a couple days later when the paint was already starting to lift and wasn't fully covering even after 4 coats, I realized the existing finish had been oil-based. Oops. It's a nightmare, and I was so frustrated with myself and the situation it took until now to gather the motivation to go through with the (long) process to fix the mess I made. 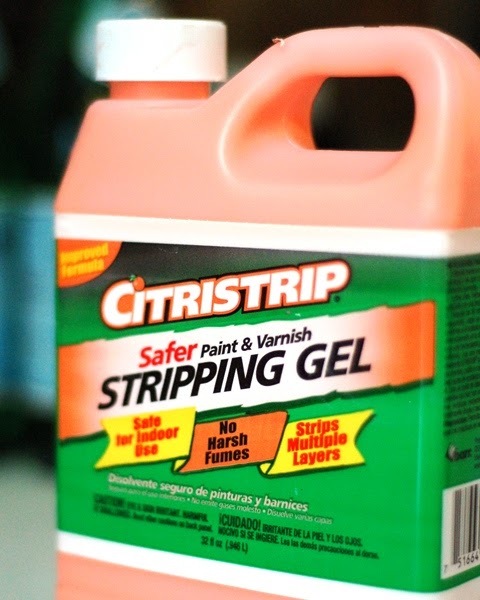 Today I bought some Citristrip, a stripper which is safe for inside work and doesn't have the harsh fumes of the really strong chemical versions -- so while it'll take a little longer probably, I've heard good things about this product... so here we go. After an hour or two I checked it and the paint scraped up nicely... but instead of three or four layers of paint there are like one hundred and three. So I reapplied and we could be here for a while. I can't wait to scrape it out of the details around the window panes -- did I mention that we should think before we act? I think this definitely falls into the category of "dumb stuff I do," except this time I'm not quite to the place where I'm laughing about it yet! One day... right? what are you going to do once you finish with it? paint it red again? different color?? I'm not 100% sure, but with the master plan for my entry I think it'll end up being white or gray. I just need to do this messy prep work before I start putting trim up and making it look nice. Question: do you think this stuff would work well on my walls that have the peeling latex (NOT MY FAULT)? I think it would end up being WAY too expensive, and it might even damage your walls? I would call a professional, because you don't want to sand those down since the house is so old it's undoubtedly got layers of lead paint in there somewhere. I have no idea if they could steam it off or if you could skim coat the wall with joint compound and that would keep it on... my gut is you need to at least consult with someone who knows what they're doing and who you trust to give you advice on how to do it right and safely. Another good option is Safe Stripper from Sherman Williams. 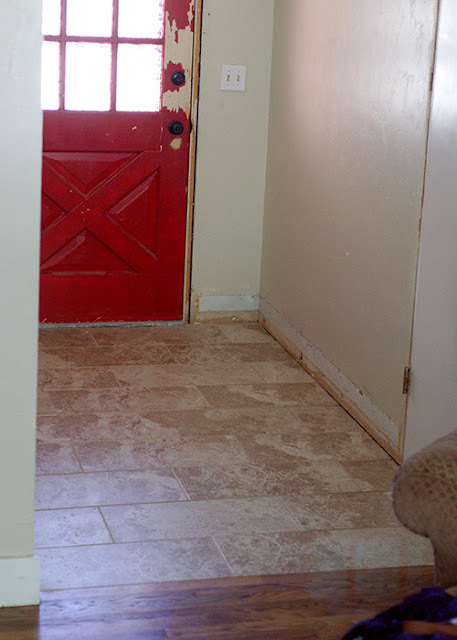 No harsh fumes and goes through multiple layers. But I found that the safe stuff takes about 4X times longer then if you go with the more chemically based ones. Jasco is amazing but it will burn. Just my two cents since i'm stripping wood work in my bathroom at the moment. Also a side note. You might want to try renting a steamer to pull the latex off the walls safely. Our bathroom had the issues of the latex painted over oil and we just steam up the bathroom and beginning pulling it off. We have about 30 left to pull off. Question. How do you decide? I am overwhelmed. I equate this with choosing greeting cards. I will spend an hour+ picking and choosing, picking and putting back..... and then finally just giving up. I feel the same way about choosing paint. Some rooms I am limited to the furniture I have and so the colors need to complement. I hate choosing paint and greeting cards. Any suggestions....for choosing paint? I have just installed iStripper, so I can watch the hottest virtual strippers on my desktop.